K6APW CA Jim says - S6 noise with poor path from OK. Only CW deciphered was the last minute. WC S9+ with very annoying deep dips. K6OQK CA Burt says - Rats!!! Sorry I missed your run. I had some time sensitive things that needed to be done. I was looking forward to this weeks "Dual" FMT to try a modification to my technique. I had everything running and arrived at home just as Marv was doing the Call Up. 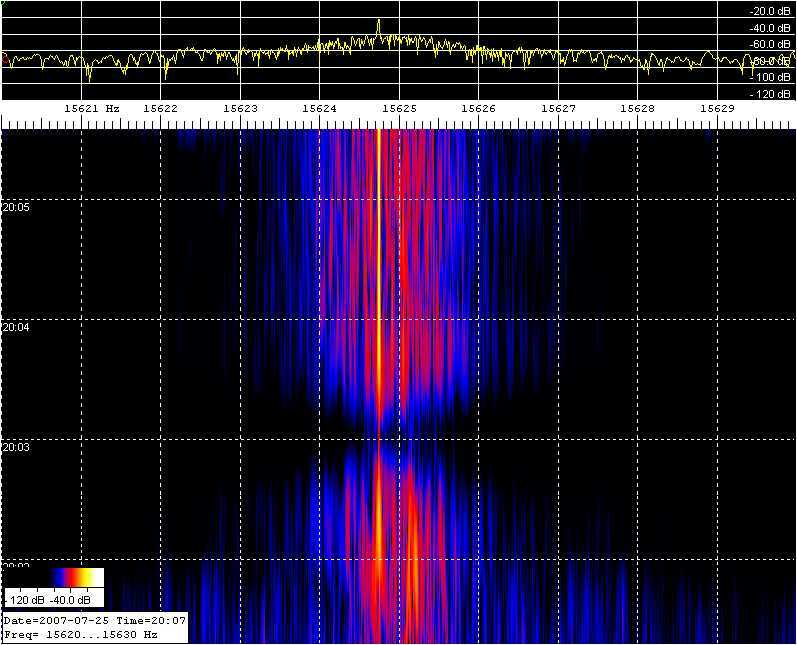 K6YAZ CA Stuart says - This was my first use of Spectrum Lab to determine fine offsets with Doppler. It will take some more experience until I am comfortable with it's use. The measured offset between the two carriers was measured as 6.29 Hz. The K5CM signal on 80 meters was quite weak last night. As usual; I set the HP 3586 as close to frequency on the main carrier but used Spectrum Lab to generate an error frequency. KM1P MA Joe says - I could clearly see sidebands of the beat frequency above and below the two carriers. If I average their offsets with the difference between the two carriers I get 3555706.189 ... super corrected? Not sure if that will help or hurt as it was difficult to see a distinct peak in the sidebands. N5PWG TX Jay says - K5CM good sig. WC rather weak. I do not measure simultaneous frequencies. My measurement of "A" alone involves these corrections: 1) receiver dial calibration- from WWV observation prior to the test - 2)Doppler correction- from WWV observation immediately before and after FMT. 3) final correction based on the published value of "A"
VE2IQ ON Bill says - Less static tonight but my lines aren't so straight. I counted 1131 complete beat cycles which took 1490358 samples at 8200.398 samples per second. So the computed beat note freq was 6.223 Hz. Thanks for the exercise! W1PW AZ Phil says - Sigs were good tonight. Doppler didn't seem too bad. Thanks again Connie and Marvin for these challenging tests! 73! W3CSW MD Bill says - Thanks Connie. Good S9 signal with S7-8 QRN levels and plenty of Doppler. W3JW VA Jeff says - Signal strength conditions were above average and QRN was less than the 18 JUL test. Doppler effects (as observed on SL waterfall display) were significant but not as severe as recent tests. Most results were obtained with SpecLab. Was able to make valid counter measurements only on the signal B keydown signal. W6OQI CA Marvin says - I need to do some practice on the 2 frequency test. 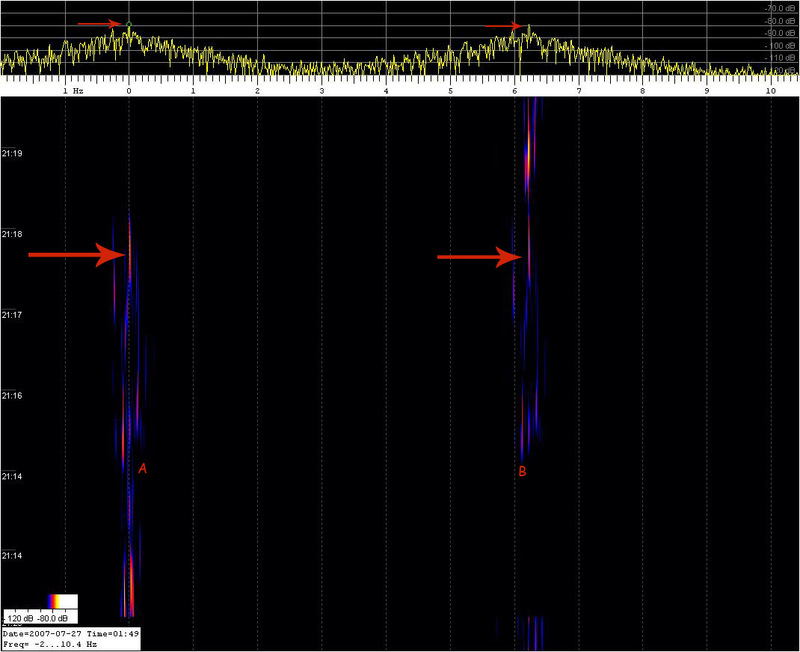 Tonight I failed to get both frequencies within my SL 10 Hz window. I have submitted what I believe to be frequency B. Though there is a chance of big error due to failing to log the frequency of my HP 3586B after retuning a little. Next week I hope to do a better job of logging the numbers. WB0LXZ KS Bill says - I tried to use Spec Lab; but 30 seconds before test chickened out and went back to ARGO. TNX. VE3OAT ON Wow, that's hard! Lets do it agan! In this example I took the wave file generated by Joe, KM1P in Boston. I re-played it with Spectrum Lab and did a capture. I added some markings with Photo Shop. As in last weeks file, it is not important to know any details form Joe as to what frequency his receiver was on. By definition it is know that Signal A is on 3555700. I looked for and found a spot when both signals A and B looked the same (top trace). Notice the two distinct peaks and the surrounding area look the same. I measured the difference between the two points, to be 6.223Hz. Add 3555700 to 6.223 to get the frequency of signal B 3555706.223 Hz, off from the true frequency by 0 Hz. Even thought A and B are only a few Hz apart there are still times when they are not peaking exactly at the same difference frequency. Its important to look for the best time to measure the difference rather than simply do an average of the entire time period. If no similar areas can be found then of course average the entire time period. Notice that the difference between A and B changes very little, over this selected one minute period. See Burt's capture of W6OQI. Would this be analogous to shooting FMT fish in a barrel ....... (Burt is about 8 miles from Marvin). Both Bill and Brad turned in impressive "corrected" readings this week. When we see a few weeks of consistency, we will widen the span of A and B.